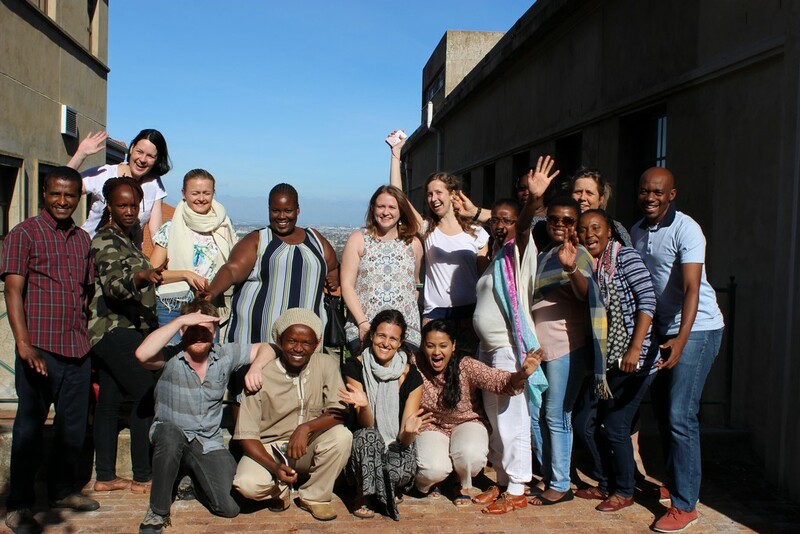 In January, a group of ASSAR’s research-into-use (RiU) coordinators and regional stakeholders spent a few days at the University of Cape Town to attend a three-day experiential learning workshop. The RiU coordinators from Botswana, Namibia, Ghana, Ethiopia and India were introduced to a number of learning activities, which they can use to improve the understanding of climate change and how it impacts the various communities they are working with. Presented by Bettina Koelle and Margot Steenbergen from the Red Cross/Red Crescent Climate Centre, the fun educational games were alternated with highly informative sessions on adult learning, effective communication and the facilitation of different learning processes. Much time was also dedicated to reflection on the learning objectives of each game, and participants were afforded the opportunity to practise the facilitation of the games within the workshop. While it might all just sound like fun and games to an outsider, each learning activity had been carefully designed to promote a better understanding of the complexities around climate change and the barriers and enablers of adaptation. Since ASSAR's RiU coordinators have the challenging task of bringing together a variety of stakeholders to discuss the impact of climate change and possible adaptation solutions in their specific region, these interactive learning activities can go a long way in opening up constructive conversation and encouraging collaboration. One such game, called 'Paying for Predictions', illustrates how difficult climate risk management and the predictions of extreme events can be. The players act as humanitarian workers who need to make decisions based on forecasts such as floods and drought. Each player is responsible for a district and has to decide on the probability for the potential disaster to happen and which actions should be taken. Beans are used as payment for preparedness and a simple roll of a dice determines the outcome of the prediction. This intensely interactive game helps participants to understand the usefulness and limitations of seasonal forecasts and the risks of both action and inaction. Other games include 'Decisions for the Decade', which focuses on the key aspects of long-term development investment under uncertainty; ‘Gender Walk’, which explores gender differences and how persons are affected by climate extremes and change; and ‘Farming Juggle’, which highlights the many stressors farmers face when farming under unpredictable conditions by throwing an increasing number of balls into a circle of participants who must try not to drop any of them as they all represent important aspects of farming. RiU coordinator in Ghana and Mali, Madonna Dolphyne, found the workshop very useful: "I am looking forward to introducing the concepts of experiential learning, and especially the games, in the regions where I work. It was also a wonderful opportunity to collaborate and exchange information with my RiU colleagues from the other ASSAR regions." Besides all the learning, the workshop was also a wonderful opportunity for the participants to get to know each other better as colleagues, something which is sometimes tricky given that ASSAR is stretched across seven different countries. For some participants, it was also their first time in Cape Town and they made full use of their free time after hours to explore South Africa’s beautiful ‘Mother City’. This downtime included a joint dinner near the Sea Point Promenade while watching the sun set over the Atlantic Ocean.